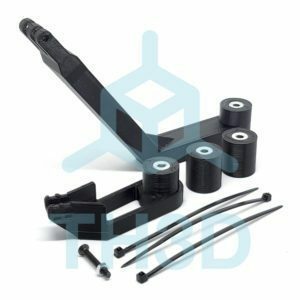 Includes all screws to mount and assemble, bearing for filament guide, 2 PTFE Fittings, high tension spring, and steel feeder gear. Purchase this product now and earn 17 benchies! 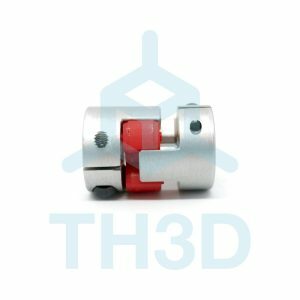 Depending on the printer you have you do NOT install the PTFE fitting on the red lever, this is optional and only shown for illustration purposes. For example on the Creality machines the fitting on the red lever cannot be used as it will hit the lead screw. The 2nd fitting is included as a spare in case you need a replacement or if you want to have a PTFE feed line. Kit works just fine. Parts are high quality and went together easily. The problem is if your filament is not perfectly straight, it’s a pain to feed it through the extruder. This kit has no guide to route the filament directly into the pulley/gear and out the other side, so if your filament is curved it slips out. I prefer other kits which have a larger input hole to allow you to use a piece of teflon tube all the way up to the gear itself. You can notch the end of the teflon tube and then there’s zero chance of missing the pulley when loading up new filament. Regardless, TH3D is great, and I’m happy to support them. I’ll probably drill out the input hole to allow for a piece of teflon tube. 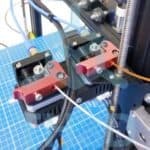 The Tough Extruder has a fully guided path as a little more expense. 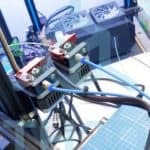 Great upgrade from stock creality injection molded ones. If you want better then go with a Tough extuder. Both work really well.